Summer is in full swing and it is hot, hot, hot. A giant Pina Colada will help cool you off but you can’t eat that for dinner. 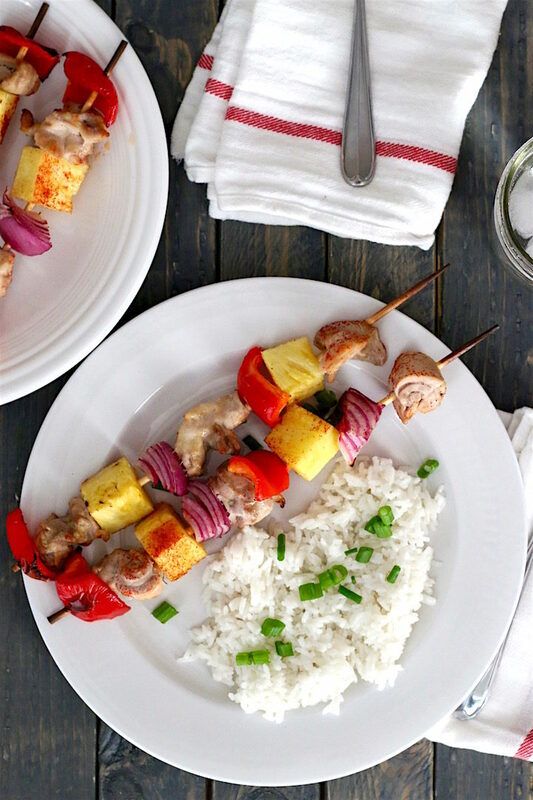 😉 If you are looking for something substantial to make to enjoy National Pina Colada Day, on July 10th, look no further, Pina Colada Chicken Kebob with Coconut Rice is the perfect winner. To celebrate I have partnered with Baker’s (The Kroger Co.) the recipe, the photos, and the opinions are that of The Kitchenarium. As a mother to four children using store brands are a total budget saver. Baker’s gives you a couple options like their Kroger brand, Simple Truth or Simple Truth Organic, and Private Selection brands. You can create healthy dinners for your family without breaking the bank. Major win! All your favorite pina colada ingredients are included in the dinner. Rum -CHECK, Pineapple -CHECK, and Coconut -CHECK Get all of the flavor with out the hangover 🙂 Aromatic jasmine rice is cooked slowly with coconut milk giving you the creamiest slightly coconut rice you have ever had. The grilled chicken and pineapple with the coconut rice is the perfect savory spin on the classic Pina Colada drink …if I do say so myself. Now you can sing *bring me two Pina Colada Kebobs, one for each hand. Let’s set sail with Captain Morgan and never leave dry land* I don’t think Garth will mind. Cheers friends! Tell me how are you going to enjoy this fun food holiday? These look delish. Thanks for sharing this recipe. I love making kababs in Summer. Such a quick, healthy yet delicious meal. The kebobs look juicy n very tempting. What a fun thing to make! 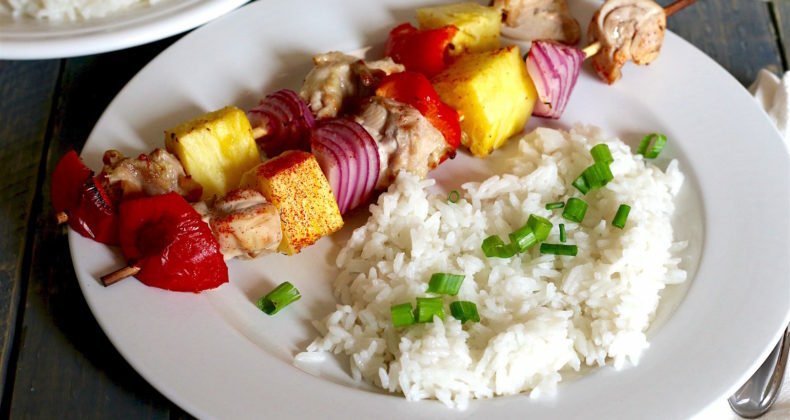 I love the idea of pairing pineapple with coconut rice! This recipe is making me hungry just looking at it! Your coconut rice looks so fluffy and perfect! I’m going to be adding this to the “must make” list very soon!